American patriots might have seen a scene similar to this one on their way to Boston to fight for independence with their fellow men at the start of the American War of Independence (1775-1783). What is happening in this painting? Look at the expressions of the people and their surroundings. The expressions and gestures of the people show they are very excited. Clearly, something is going on. Look carefully. Do you see a clue that tells you the time period? The year “1770” is written on the side of one of the buildings. What happened in the early 1770s in colonial America? The original thirteen colonies in America joined together to break free from the British Empire and its king—King George III—who ruled over them and form a democracy in its place. Describe the scene. In the center of the village there are a blacksmith and three mounted men. The blacksmith wears the leather apron of his trade. Nearby, a young man comes out of the blacksmith’s shop with a gun in his hands. A boy lugs a bucket of water and turns to watch and listen. A woman pokes her head out of a second-story window. 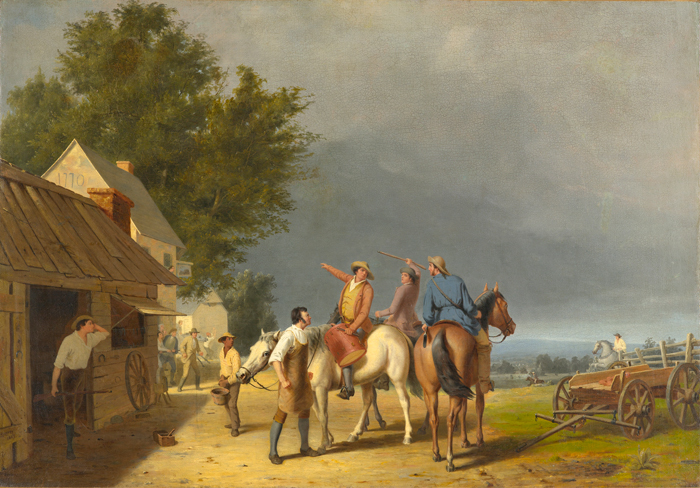 Several people with guns in their hands hear the call to arms and advance toward the three mounted men, while a man pulls on a rope to sound the bell and alert the whole village. 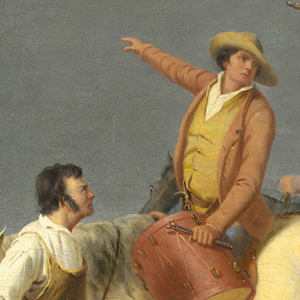 On the right hand side, a man races on a rearing horse toward the village, eager to join his friends in their fight for independence. Farther away a second rider approaches. On the horizon another village is barely visible. One can imagine a similar scene taking place there, in which men are getting ready to go to war. How does the artist portray the approach of the war symbolically? Notice the dark clouds in the distance. He portrays the coming war as a storm gathering on the horizon. Would you like to see First News of the Battle of Lexington in person? All you have to do is visit the North Carolina Museum of Art in Raleigh, North Carolina. 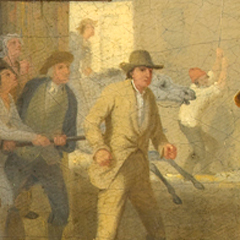 First News of the Battle of Lexington is in the American galleries at the museum. Or perhaps you would like a tour. Tours of the collection are given daily, except for Monday when the museum is closed to the public. If you prefer, you can contact the museum ahead of time and arrange for you and your friends to have a private tour. I’m sure a docent at the museum would be happy to show you and your friends First News of the Battle of Lexington and many other works of art. Whether you visit the museum on your own or have a tour with a docent, it will be well worth your time!